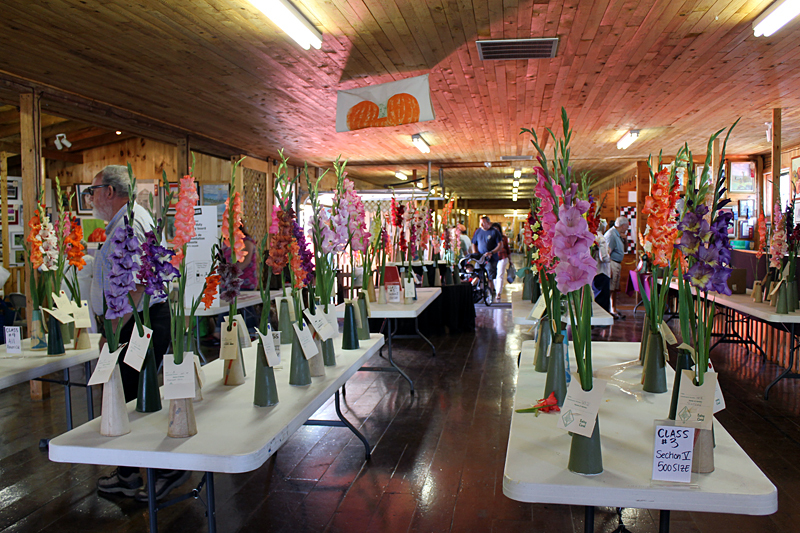 The 2013 Maine Gladiolus Society exhibition was uneventful by comparison to the previous couple. There was no hurricane, as in 2011, and no three-spike containers felt the deleterious effects of gravity, as in 2012. It was, in fact, smooth sailing down to the sale of blooms at the end of the night. Come to think of it, I’m a little worried about what might happen in 2014’s show, since we seeming to have gotten a pass last year. Exhibitors showed up bright and early on the morning of August 25th, 2013. Vases had already been filled the night before, and by the time I arrived at 9:30 or so, a great many glads had already been laid out or placed in vases. It was down to the wire when it came to getting those vases out on the tables, though, and we were definitely happy for the help of those folks who either brought a limited quantity of glads to show, or none at all, and had time to deliver the glads to their destinations in the exhibition hall. Candy Cane by one vote. This is the first time I can remember in the two and a half decades I’ve been witness to the show that Candy Cane has been entered into MGS’s People’s Choice and has not come out on top. In the open competition, Gemini was judged best 100-size, while Fruehling took the red ribbon for the class. Joker’s Wild got the blue for the 200-size glads; Buttons came in second. Purple Haze came out on top in the 300-size class, with Lady Lucille close behind, and in 400-size glads it was Cloud 9 at the front, with Doc bringing up the rear. The 500-size competition was neck-and-neck between an unknown Russian glad, which won by a nose, and Podmoskovia, coming in second, but the unknown Russian was ultimately disqualified from judging when it came time to choose the Grand Champion and Reserve Champ. In the seedlings class, 204 JM was first, and 13E was second. Star Performer took home best All-American, and Apple Blossom was runner-up. Summer Rose was judged to be the best of the Old Timers, and True Love came in second. In the youth category, Cates grandsons Nicholas and Ethan took home first and second with The King’s Kisses and Ethan, respectively. Now, I’m sure what you’re all wondering is — which glad took home the honor of Grand Champion? In the end, it was Doc that reigned supreme, with Buttons as the reserve champion. Allegro was declared to be the champion 3-spike, with a beautiful display of American Dream picking up the reserve 3-spike rosette. 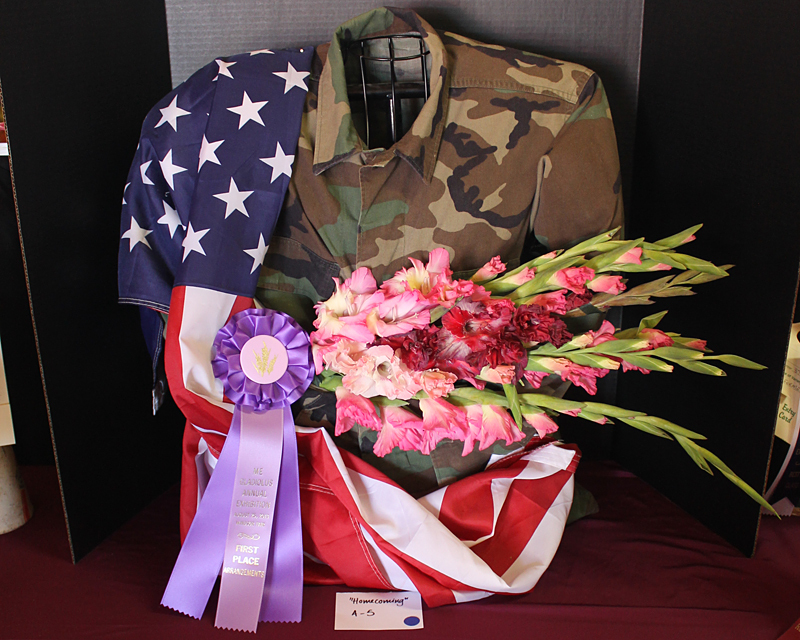 Best arrangement went to Vicky Mosher for her “Homecoming,” based on the category “Patriot’s Dream,” with a flag-draped US military fatigues jacket cradling a bouquet of glads in pink and rose. Mosher’s “Potayto, Potahto,” based on the category “Amber Waves of Grain” brought home the arrangement runner-up rosette, with a little straw scarecrow peeking through columns of russet potatoes and glads in harvest golds, oranges, and greens. 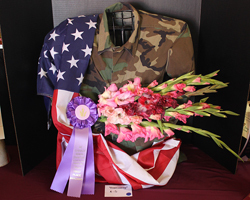 We hope to see even more beauty and creativity at this year’s show!